The dual release of the albums Iris and Opaline marks something of a nexus point in Igneous Flame’s sonic narrative, the last time Pete Kelly will pull from a sound-set that has informed several of his past releases. The music offered here represents three years of work and mostly departs from the warm, frequently dark ambient flows that are most familiar to Igneous Flame fans. (Don’t worry—you still get that, too.) This is the sound of Kelly playing with rhythm, distinct guitar lines, and world music flair, and to be honest it’s a bit of a hit-and-miss affair for me. While there are a lot of moments that fully catch my attention and even give me that familiar “oh, yeah” sensation, I never feel fully engaged with the music. True, I could loop “Cherry Blossom Day” and its smooth, round Manring-style bass tones all day. The dynamic here is excellent, with Kelly dropping out the rhythm to let notes float gently around before picking it all back up again. There’s also a superb, underplayed use of field recording here that adds some dimension. And I dig on the peppy tone of “Axis,” loaded with sharp hand drumming (or its electronic equivalent). Again, part of the equation is to drop into a spacey zone with one element remaining strong and then bring it back up to speed. The opening track, “Krakatoa,” gives us some serious guitar rips, runs and riffs that land with a potency I hadn’t expected from this artist. But damn, it works, expecially around the six-minute mark. “Dream of Form” catches an island vibe with deeper drums laying down a base for gorgeous, sliding guitar lines. (And, again, it goes melodic/drop/coast/melodic.) For much of the rest of the release, I’m sort of in and out, easing along on what’s a pleasant enough bit of work, as unobtrusive as we like our ambient to be—but this isn’t really ambient music, and I’d like it to hold my attention more potently. 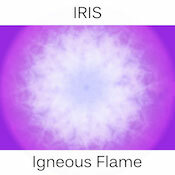 Iris is another of those releases where Kelly has exploited the time-boundary-free aspect of the electronic release, clocking in at almost two hours. For me, it could have been shorter and possibly more effective for it. Opaline is the one that’s more likely to appeal to long-time Igneous Flame listeners. Pulling from the same sound-set, the artist heads into long-pad territory, but weaves light elements of unprocessed guitar and keys through the mix. As ever, small textural sounds populate the flow to reward deep listening. “Incandescence” coasts quietly along, going out on softly fading electric piano notes, and gives way to bold opening chords on “Overtone Ensemble.” Kelly plays with a church-organ-style sound on this track, and does a great job of melting them from their dramatic start into wispier vocal pads. The strong guitar passages return on “Lilac Haze,” when a beautiful riff elevates up out of the deep ambience. This is what makes Opaline the more attractive of the two releases for me; I like the way the rhythmic elements layer in to the ambience, rather than the having the ambient passages arrive like a drop in the middle of something more uptempo. It’s a better transition, and it’s used sparingly on these five tracks. On his web site, Kelly notes that the music here is “not perfect.” I’d agree, not just because nothing every truly is, but also because as a long-time fan, I do find some of the work on Iris a bit forced—and this is a word I’ve never used in regards to his music before. I think ambient fans will find a lot to enjoy on Opaline, and it packs enough non-ambient elements to broaden its appeal. As Pete Kelly puts this packet of sounds away and explores new sources and motifs, I have to say that the last several albums that came up out of this pool have been among my favorites. I’m looking forward to what’s next from this excellent artist.